It’s fairly commonplace these days for news outlets to reference prediction markets as part of the election cycle. We often hear about betting odds on who will win the primary or be the next president, but I haven’t seen many commentators use prediction markets to infer the electability of each candidate. With that in mind, I took the betting odds for the 2016 US presidential election from Betfair and used them to calculate the perceived electability of each candidate. Electability is defined as a candidate’s conditional probability of winning the presidency, given that the candidate earns his or her party’s nomination. 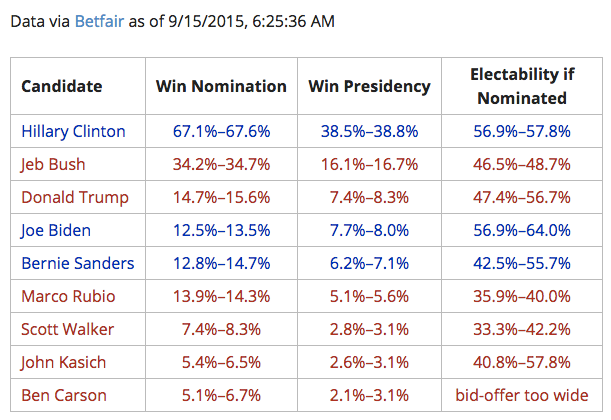 I’m no political analyst, and the data above will continue to update throughout the election season, making anything I write here about it potentially immediately outdated, but according to the data at the time I wrote this on September 15, 2015, betting markets perceive Hillary Clinton as the most electable of the declared candidates, with a 57%–58% chance of winning the presidency if she receives the Democratic nomination. Betting markets also imply that the Democrats are the favorites overall, with about a 57% chance of winning the presidency, which is roughly the same as Clinton’s electability, so it appears that Clinton is considered averagely electable compared to the Democratic party as a whole. On the Republican side, Jeb Bush has the best odds of winning the nomination, but his electability range of 47%–49% means he’s considered a slight underdog in the general election should he win the nomination. Still, that’s better than Marco Rubio (36%–40%) and Scott Walker (33%–42%), who each have lower electabilities, implying that they would be bigger underdogs if they were nominated. The big surprise to me is that Donald Trump has a fairly high electability range relative to the other Republicans, at 47%–56%. Maybe the implication is something like, “if there’s an unanticipated factor that enables the surprising result of Trump winning the nomination, then that same factor will work in his favor in the general election,” but then that logic should apply to other longshot candidates, which it seems not to, so perhaps other caveats apply. Why are the probabilities given as ranges? Usually when you read something in the news like “according to [bookmaker], candidate A has a 25% chance of winning the primary”, that’s not quite the complete story. The bookmaker might well have posted odds on A to win the primary at 3:1, which means you could bet $1 on A to win the primary, and if you’re correct then you’ll collect $4 from the bookmaker for a profit of $3. Such a bet has positive expected value if and only if you believe the candidate’s probability of winning the primary is greater than 25%. But traditional bookmakers typically don’t let you take the other side of their posted odds. In other words, you probably couldn’t bet $3 on A to lose the nomination, and receive a $1 profit if you’re correct. Betting markets like Betfair, though, do allow you to bet in either direction, but not at the same odds. Maybe you can bet on candidate A to win the nomination at a 25% risk-neutral probability, but if you want to bet on A to lose the nomination, you might only be able to do so at a 20% risk-neutral probability, which means you could risk $4 for a potential $1 profit if A loses the nomination, or 1:4 odds. The difference between where you can buy and sell is known as the bid-offer spread, and it reflects, among other things, compensation for market-makers. The probabilities in the earlier table are given as ranges because they reflect this bid-offer spread. If candidate A’s bid-offer is 20%–25%, and you think that A’s true probability is 30%, then betting on A at 25% seems like an attractive option, or if you think that A’s true probability is 15% then betting against A at 20% is also attractive. But if you think A’s true probability falls between 20% and 25%, then you probably don’t have any bets to make, though you might consider becoming a market-maker yourself by placing a bid or offer at an intermediate level and waiting for someone else to come along and take the opposite position. Betfair offers betting markets on the outcome of the general election, and the outcomes of the Democratic and Republican primary elections. Although Betfair does not offer betting markets of the form “candidate A to win the presidency, if and only if A wins the primary”, bettors can place simultaneous bets on A’s primary and general election outcomes in a ratio such that the bettor will break even if A loses the primary, and make or lose money only in the scenario where A wins the primary. We’ve constructed our bets so that if A loses the primary, then we neither make nor lose money, but if A wins the primary, then we need A’s probability of winning the election to be greater than 62.5% in order to make our bet positive expected value, since 0.625 * 75 + 0.375 * -125 = 0. As an exercise for the reader, you can go through similar logic to show that if you want to bet on A to lose the presidential election but have 0 profit in case A loses the primary, then you need A’s conditional probability of winning the general election to be lower than 44% in order to make the bet positive expected value. In this example then, A’s electability range is 44%–62.5%. This analysis does not take into account the total amount of money available to bet on each candidate. As of September 2015, Betfair has handled over $1 million of bets on the 2016 election, but the markets on some candidates are not as deep as others. If you actually tried to place bets in the fashion described above, you might find that there isn’t enough volume to fully hedge your exposure to primary results, or you might have to accept significantly worse odds in order to fill your bets. It’s possible that someone might try to manipulate the odds by bidding up or selling down some combination of candidates. Given the amount of attention paid to prediction markets in the media, and the amount of money involved, it’s probably not a bad idea. In 2012 someone tried to do this to make it look like Mitt Romney was gaining momentum, but enough bettors stepped in to take the other sides of those bets and Romney’s odds fell back to where they started. Even though that attempt failed, people might try it again, and if/when they do, they might even succeed, in which case betting market data might only reflect what the manipulators want it to, as opposed to the wisdom of the crowds. The electability calculation ignores the scenario where a candidate loses the primary but wins the general election. I don’t think this has ever happened on the national level, but it happened in Connecticut in 2006, and it probably has a non-zero probability of happening nationally. If it were to happen, and you had placed bets on the candidate to win the primary and lose the election, you might find that your supposedly safe “hedge” wasn’t so safe after all (on the other hand, you might get lucky and hit on both of your bets…). Some have speculated that Donald Trump in particular might run as an independent candidate if he doesn’t receive the Republican nomination, so whatever (probably small) probability the market assigns to the scenario of “Trump loses the Republican nomination but wins the presidency” would inflate his electability. There are probably more caveats to list, for example I’ve failed to consider any trading fees or commissions incurred when placing bets. Additionally, though I have no proof, as mentioned earlier I’d guess that candidates who are longshots to win the primaries probably have higher electabilities due to the implicit assumption that if something so dramatic were to happen that caused them to win the primary, probably the same factor would help their odds in the general election. Despite all of these caveats, I believe that the implied electability numbers do represent to some degree how bettors expect the candidates to perform in the general election, and I wonder if there should be betting markets set up that allow people to wager directly on these conditional probabilities, rather than having to place a series of bets to mimic the payout structure.